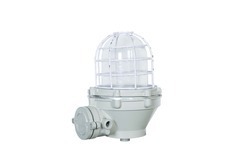 Leading Manufacturer of flameproof light fixture from Thane. 200W/300W GLS, 3x26W CFL, and 300W GLS Lamp without control gear. • Lamps : LED Lamps/CFL/GLS Lamp/ PL Lamp/HPMV Lamp. • Entry : Maximum 3 Nos. (2 from side and 1 from top side). • Rated Voltage : 250V AC 50/60 Hz.